I am originally from Italy, where I got my Bachelor and Master Degrees in Medical and Molecular Biotechnologies at the San Raffele University in Milan. I then moved to Switzerland, at the University of Zurich, for my PhD working in the field of Cellular Oxygen Physiology. I stayed at the University of Zurich and started working supported by a Roche Postdoc Fellowship in the Lab for Retinal Cell Biology led by Christian Grimm in 2015. The research topic I am currently working on deals with age-related macular degeneration (AMD), the leading cause of blindness in the elderly population in Western countries1. AMD is a progressive disease affecting the central region of the retina and therefore high acuity and colour vision. The primary tissue involved in the pathogenesis of the disease is the retinal pigment epithelium (RPE) which degenerates and cannot exert its fundamental function of supporting the photoreceptors2. The mechanisms leading to RPE and, consequently, photoreceptor cell death are largely unknown. 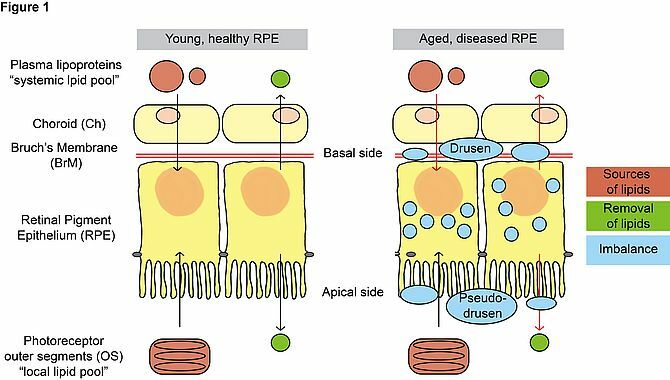 Drusen and pseudo-drusen are extracellular deposits found on the basal and apical side of the RPE in aged eyes and are considered histological markers of AMD3. Lipids and apolipoproteins are among the most abundant components of these deposits4, 5 and genes involved in lipoprotein metabolism have been linked to AMD in genome-wide association studies6. Moreover, primary RPE cells isolated from AMD donors accumulated intracellular lipid droplets in culture7. Taken together, these evidences point in the direction of an imbalanced lipid metabolism in the aging eye (figure 1) and a possible involvement of lipoprotein-related genes in developing AMD. The hypothesis is supported by the fact that RPE cells daily handle huge amounts of lipids coming from the phagocytosis of photoreceptor outer segments (OS)8 and rely on an efficient lipid metabolism to properly process this material. Figure 1 Schematic representation of a young, healthy RPE and its main lipid sources (the systemic pool of lipoproteins on the basal side and the local pool of OS on the apical side) and ways to remove excessive lipids (lipoprotein secretion). In the aged eye, imbalanced lipid metabolism may lead to intracellular and extracellular (drusen and pseudo-drusen) lipid accumulation. Our goal is to understand the physiological role in the RPE and, possibly, the contribution to AMD development of genes involved in lipoprotein metabolism. As shown in figure 2A, most of the tested genes involved in lipoprotein generation, remodelling and uptake are expressed in human eyecup tissue, supporting the hypothesis of a local role of the RPE in lipid metabolism within the eye. 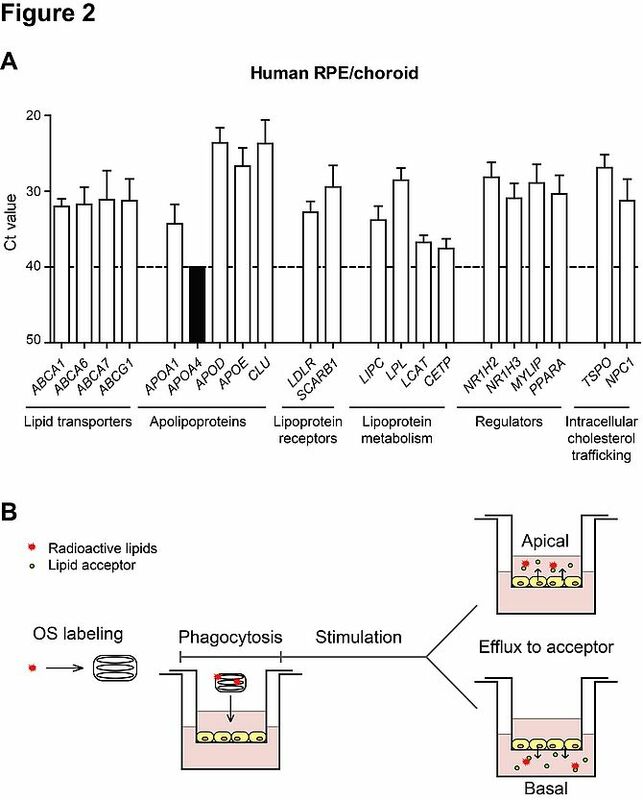 We developed radioactivity-based lipid efflux assays, including OS-derived lipids, in polarized RPE cells in vitro in order to study the contribution of selected genes to this process (figure 2B). At the moment, we are focusing on the ATP binding cassette transporters A1 and G1 (ABCA1/G1), which are involved in lipid efflux and biosynthesis of high-density lipoproteins (HDLs)9. We generated an RPE-specific Abca1;Abcg1 knock out mouse and we are currently evaluating retinal morphology and function in this model. Moreover, we are collecting human samples in order to assess the link between the lipid efflux machinery and the development of AMD. Figure 2 A. Expression of lipoprotein-related genes in post-mortem human donor eyecups (RPE/choroid) as measured by semi-quantitative PCR (Ct = threshold cycle). B. Schematic representation of the lipid-efflux assay in cultured RPE cells. Preliminary results demonstrate that the RPE expresses the genes necessary for lipoprotein metabolism and that the ABCA1/G1 lipid efflux pathway is fundamental for proper function and survival of RPE cells. In the near future, we will further investigate the link between selected lipoprotein genes and human AMD disease and evaluate the attractive hypothesis of targeting the ABCA1/G1 pathway to promote RPE survival and resolve, at least partially, lipid-handling imbalance in the aging eye. Wong WL, Su X, Li X, et al. Global prevalence of age-related macular degeneration and disease burden projection for 2020 and 2040: a systematic review and meta-analysis. The Lancet Global Health 2014;2:e106-e116. Lim LS, Mitchell P, Seddon JM, Holz FG, Wong TY. Age-related macular degeneration. The Lancet 2012;379:1728-1738. Curcio CA, Johnson M, Rudolf M, Huang J-D. The oil spill in ageing Bruch membrane. British Journal of Ophthalmology 2011;95:1638-1645. Wang L, Clark ME, Crossman DK, et al. Abundant lipid and protein components of drusen. 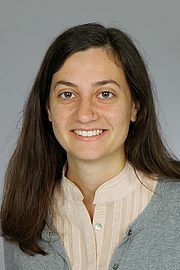 PLoS ONE 2010;5:e10329. Rudolf M, Malek G, Messinger JD, Clark ME, Wang L, Curcio CA. Sub-retinal drusenoid deposits in human retina: Organization and composition. Experimental Eye Research 2008;87:402-408. Fritsche LG, Igl W, Bailey JNC, et al. A large genome-wide association study of age-related macular degeneration highlights contributions of rare and common variants. Nat Genet 2016;48:134-143. Golestaneh N, Chu Y, Xiao Y-Y, Stoleru GL, Theos AC. 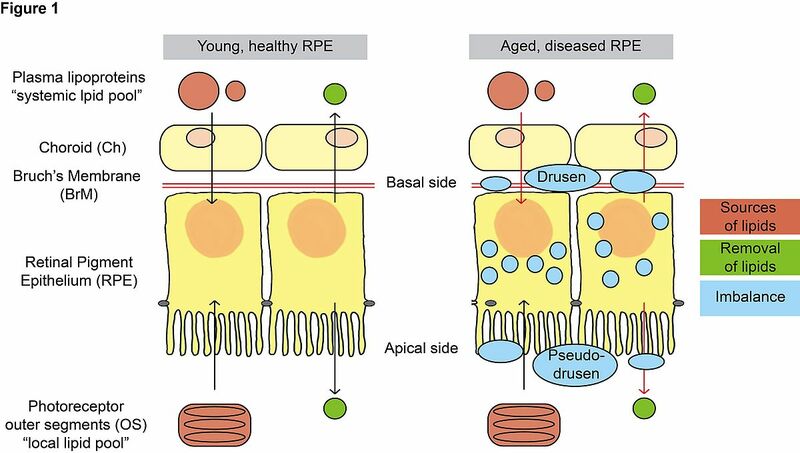 Dysfunctional autophagy in RPE, a contributing factor in age-related macular degeneration. Cell Death Dis 2017;8:e2537. Anderson DH, Fisher SK, Steinberg RH. Mammalian cones: disc shedding, phagocytosis, and renewal. Investigative Ophthalmology & Visual Science 1978;17:117-133. Quazi F, Molday RS. Lipid transport by mammalian ABC proteins. Essays In Biochemistry 2011;50:265-290.